Fascinating. A new hashtag slogan is born. #NoMoreSilence. It makes sense - the moment of silence does have a kind of submissive, resigned quality to it. Ramp it up Lefties. Grab dem guns! I need some entertainment. Obongo finally shook off a bit of his natural torpor. Was it because Trump implied Obongo was soft on Muzzie terrorists, or because the target of this Muzzie terrorist was a bunch of faggots? Perhaps a bit of both. Two of Obongo's favorite things just collided, and he must be very emotionally fragile as a result. HA! This is not the moonchild ex-wife mind you, but the current wife and mother of his three-year-old. She apparently knew what was going to happen and did nothing. How incredibly dim she must be if that is true. Her life is destroyed. She should have gotten on the first flight back to DurkaDurkastan as soon as news broke. A Leftist, Muzzie journalist dares to speak the truth, and suggest that you cannot have a tolerant, MultiKultural society and not condemn Islam for its worst qualities. He's right, of course. But he has dangerously wandered out of the double-think trap of Leftism while looking for consistency in his beliefs. He has seen Lefties criticize Christianity for much less severe actions than Islam, and yet seen Islam protected by same Lefties. He doesn't get why, because he doesn't understand that MultiKulturalism isn't about uniting the world in love, peace, and happiness. It is about killing off White people. And when MultiKulturalism accomplishes this, it will have signed its own death warrant, because it cannot exist without White People. Oh, Mr. Muzzie Journalist, you are so close to the truth. You are almost there! 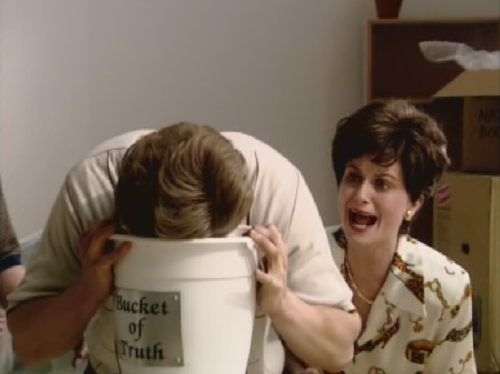 But, for the sake of your sanity, stay away from the Bucket of Truth!